Bottled on 8/6/17.Pours a deep walnut brown with a thinner lighter beige head that is gone very quickly.Roasted nut aromas with a bit of dark fruit and dark brown sugar,quite sweet.A mellow fuller feel makes for smoother drinkability.The honey sweetness comes thru on the palate and gets bigger as it warms,molasses notes give off more sweetness before an earthy/nutty finish.Not great but it's not bad,it's starts out quite sweet but a dryer finish is the best part of the beer. Baltic porter brewed with honey, 8.5% ABV. 12oz single. Pours out to a clear deep brown, forming a nice soapy light tan head with very good retention and lacing. Carbonation is moderate, ~2.5 carbs or so. The nose smells nothing like a baltic porter...no raisin or molasses notes. It has a budweiser type lager yeast profile, slight DMS, a very subtle earthy hop note. With the eyes closed, it smells very much like a domestic macro brew, like michelob dark. The taste, thankfully is better than the nose, but not by much. Overall, a moderate sweetness as a Baltic porter should be, minimal roast but very subtle raisin if at all, no prunes or molasses. Mouthfeel is not cloying, medium dense bodied. There is a quite unpleasant fusel note and a bit of wet cardboard through the beer, but it really stands out in the aftertaste, making me not want to drink the rest of the bottle. Quite boozy. Not a good beer at all. Bad recipe, bad technique, oxidized and fusel. Definitely not recommended. A drain pour. Pours a brown some highlights around the edges, thumb sized tan head leaves some spotty lace. Aroma is roasted notes, charred caramel, honey light earthy smokey notes. For a big Baltic Porter a little subdued. Taste is a little better roasted notes charred caramel, some good earthy notes hints of chocolate and honey sweetness. Finish little bite of earthy hops to keep it from being to sweet. Mouthfeel is big medium more porter like then stout so nice job there. Overall eh not a bad beer not something to go searching for either. At least it is porter like instead of stout like some Baltic Porters shot for. Before The CANQuest (tm), there were all of my other proclivities. I am currently reading Martin Limon's George Sueno & Ernie Bascomb series. The latter was a two-tour Viet Nam vet who came home & realized that there was no "there" there" & decided to stay in as a decidedly unconventional member of the Army CID. He wears glasses, chews gum, has relations with (ahem!) women of dubious nature & drinks copious amounts of alcohol while promoting anarchy & starting fights. Sound familiar? I was already into good beer when we hit Haifa, Israel in 1992, but when a tall, leggy Ukranian put me onto Baltika #6 Porter, I was sent. When I eventually landed at the University of Pittsburgh in 1999, I knew of Stash (St-ah-shh) & his Bloomfield Bridge Tavern (BBT), but when I showed up, speaking fluent Pixburghese, ordering the Red Plate (as opposed to the White Plate), the colors of the Polish flag, he embraced me like an old pal! We quickly became friends, given my interest in languages, foods & other cultural amenities. One night, he Pop!ped open a bottle of Baltika #6 & I was sent into a memory. We smoked stogies, watched Th' Stillers & I participated in a couple of Dyngus Days! Good times. This is the standard by which every Baltic Porter is measured - would Stash approve? 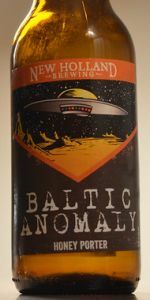 From the bottle: "Much like the alien mystery found at the bottom of the Baltic Sea, this flavored Baltic Porter boasts an anomaly of its own. Honey lends an extraterrestrial dimension to this earthly Porter, balancing out the dry sweetness with a slightly dry finish." I Pop!ped the cap with a slight twinge of nostalgia. Their once & former PHL-area sales rep & used to do some major damage before, during & especially-after fests. I have a soft spot (or is it a hard-on?) for their beers as a result. I gave it a rather gentle pour, thanks to my flight of nostalgia, but upon coming out of my reverie, I gave it an in-glass swirl, producing a brief finger of foamy, fizzy, light-tan head. The interval was equivalent to my time with my Ukrainian honey-honey, but it was equally meaningful. Color was Dark Brown to Very Dark Brown (SRM = > 27, < 34) with good quality, allowing me to note mahogany highlights. Hello, gorgeous! Nose had the slightly smoky, sort of oily, kinda burnt smell of a Porter pulling on the braking signal as things ground to a stinking, screeching halt. Oh, man. Have you every smelled burning bakelite? That is that odor when the conductor realizes that the station is approaching TOO quickly & really lays on the brakes. The good Porters are evocative of this, not cleaned up to smell pretty. A Porter is a working-class beer & a Baltic Porter evokes the working class of Latvia, Estonia & Lithuania, or it should. McCoy was a railroad oiler whose job entailed stopping the train before it could be properly oiled, but his in-motion oiler led others to want "the real McCoy". This slick, oily, semi-sweet beer was the real McCoy! It tasted of everything from burnt oil to blackstrap molasses to a "Guinea stinker" Parodi cigar to the business end of a long-used horsewhip to the soothing honey dripped out of the jar & onto Grummy's biscuits. Finish was dry. Don't let the label fool ya. The Porter delivered, extraterrestrials be or be not damned! Aren't there enough adjuncts without adding E.T.s? Why do I need an I-Love-Me Jacket again?!? Haven't I been a good boy? Pours a dense black color from a 12 0z bottle into a pint glass, with some yellowish light coming through when held to a light. Dark tan head is medium sized and very bubbly but fades out fast without a trace. No lacing on the glass. Aroma and taste have a bit of complexity to them and are impressive enough. Aroma features roasted malt, a little coffee and chocolate and a very definite sweetness from the honey. Taste is more of the same but there is also some mild floral hops presence and some bitterness to round out the bready malt and the honey. Mouthfeel is rich, with a little alcohol "burn". A big somewhat sweet malty presence up front with some alcohol and mild floral hops bitterness in the finish. Best as a colder weather sipper, it is also good to accompany a meal. A very enjoyable strong Porter. I had high hopes for this as soon as I saw Baltic in the name. They do call it a Baltic porter on their web site, but it is the best behaved Baltic porter I've had. It pours a beautiful black with fine head. The aroma is sweet and dark from a bit of bittering hops or something. Very nice. The taste is reserved, to a fault. It lacks the ridiculous flavoring common in the style and goes for a much more balanced approach. Malts and bitter tastes combine but don't gang up on you. To me it doesn't seem true to the style, but it is much easier drinking than these usually are. It has a clean finish, for the style. I consider Baltic porters the bad boys of porters, but this one is not of that usual bent. It is, however, delicious and easy to enjoy (the uninitiated might think it a huge brew). If my wife does not get home too soon I may drink two of these and throw on some Amon Amarth for sonic harshness. I will warm the second one considerably before I start - that should add to the flavor. Recommended as a Baltic porter that does not bite and needs no aging. Dark brown to black with ruby highlights ans a 3 finger brown head that gradually recedes to nothing. Aroma of dark chocolate malts, honey and a hint of vanilla. Somewhat woody and smokey. Rich in taste and rather sweet. Lightly charred wood, a bit more subtle than the aroma. Rather strong taste of alcohol upfront, but this mellows later. Medium full in body. Medium carbonation, yet silky at the same time. A little cloying at first. Taste: rich, semi sweet, deep roasted dark chocolate malts, hint of honey, smooth finish. Nice semi smoked dark malt and baker's cocoa nose. Black, opaque for the most part, with a tan refined head and ringed lace on glass. Full but not heavy body. This toasty porter went well with my burger. Poured into a Fremont small snifter. Pours a very dark mahogany brown, appearing nearly opaque black in the glass with a half finger dark khaki head with great retention and nice lacing. Aroma of dark toasted malt, molasses, light cocoa and nuts, somewhat muted and mineraly. Flavor is semi-sweet dark toasted malt, honey, chocolate milk, light raisins and nuts. Finishes a little thin, with mild dark malt and cocoa. Medium bodied with light creaminess. The base profile seems similar to New Holland's bigger Dragon's Milk stout, but with a slight raisin fruit note appropriate for a Baltic porter, light cocoa and honey. Flavors are classic for the style, but seem oddly muted, perhaps because of the honey component which adds both a slight sweetness and flavor. Tastes good, but could use a bit more robust malt flavor, especially at this ABV. Both aroma and flavor are somewhat muted. Bottled on 8/7/17. 12oz bottle poured into a tulip. Pours a dark brown, almost black, with bubbles racing upwards; small light khaki head that falls leaving nice retention and sticky lacing. The aromas are malt forward with some hints of cocoa and smoke. Some subtle hints of anise/black licorice. The flavors follow the nose for the most part. More cocoa and smoke. The honey comes through without dominating. It gives it a nice balanced sweetness. Some marshmallow in the mix. Strong malt backbone. Alcohol is well hidden. Mouthfeel is nice. It's on the lighter side of full-bodied with active carbonation. It's smooth and dangerously drinkable. This is a nice Baltic porter. The honey adds to the flavors. It's enjoyable stuff. Well done. From the neck of the bottle in yellow dots: "BOTTLED 08/17/17 15:55"
Appearance: The beer has a black body and a large, frothy, light tan head. The head slowly fades out and leaves a nice bit of lacing. Aroma: It has a very light scent of flowery hops and just a whisper of what smells a bit like pumpkin puree. Taste: Up front there is this burnt caramel flavor. This moves to a bit of ash and acrid metal which finishes with an even stronger ash flavor. The finish is a slightly sweet caramel flavor. Mouthfeel: It has a bit of a chalky mouthfeel but overall it is nice and smooth with very good drinkability. Overall: This beer is not without its oddities but as a cohesive beer it is good. It is hard to tell if the honey (as indicated from the label) plays any part in this beer but it does have a touch of a sweet edge at the end. It doesn't take on any mead-like character. I would probably drink it again from time to time. I wouldn't likely recommend it to anyone but it's good enough to thrown in a six pack mixer. 12 ounce bottle into tulip glass, bottled on 8/7/2017. Pours crystal clear very dark brown color with a 1-2 finger fairly dense and fluffy khaki head with good retention, that reduces to a small cap that lingers. Nice spotty soapy lacing clings around the glass. Aromas of big milk chocolate, cocoa, caramel, honey, brown sugar, nuttiness, and toasted brown bread; with lighter notes of coffee, smoke, raisin, plum, fig, herbal, grass, and roast/toasted earthiness. Damn nice aromas with great balance and complexity of dark/roast/bready malt, honey, and light earthy hop/fruity yeast notes; with great strength. Taste of big milk chocolate, cocoa, caramel, honey, brown sugar, nuttiness, and toasted brown bread; with lighter notes of coffee, smoke, raisin, plum, fig, herbal, grass, and roast/toasted earthiness. Light herbal/grassy hop and roasted bitterness on the finish. Lingering notes of milk chocolate, cocoa, caramel, honey, brown sugar, nuttiness, toasted brown bread, light coffee/fruits, herbal, grass, and roast/toasted earthiness on the finish for a while. Great complexity, robustness, and balance of dark/roast/bready malt, honey, and light earthy hop/fruity yeast flavors; with an awesome hop/roast bitter/sweet balance, and zero cloying flavors after the finish. Lightly increasing dryness from hop/roast bitterness. Medium carbonation and medium-full body; with a very smooth, creamy/bready/grainy, and lightly sticky/chalky balanced mouthfeel that is great. Alcohol is well hidden with a mild warmth lingering after the finish. Overall this an excellent Baltic porter! All around great complexity, robustness, and balance of dark/roast/bready malt, honey, and light earthy hop/fruity yeast flavors; very smooth and easy to drink for the ABV. Absolutely spot on style example. Rich and complex malts without being too roasty; with restrained fruity yeast and balancing earthy hop character. Honey works perfectly with the darker malt flavors. A very enjoyable offering.